This 17th Century, listed historic house stands at the heart of Winchmore Hill Conservation Area, which retains the charm of past times, yet is very much a part of modern London. Fast trains to the centre of the City are just 2 minutes walk away, taking you in 25 minutes to the West End, theatre-land, shops, tourist sites and museums, and to the Eurostar International Terminal. Cafes, restaurants, pubs and shops are nearby on Winchmore Hill Green. We offer family-run accommodation with a friendly welcome. THE COTTAGE at The Old Bakery London is an unique holiday home sleeping 4 in two spacious, en-suite bedrooms. It is in the most historic part of the Old Bakery London. 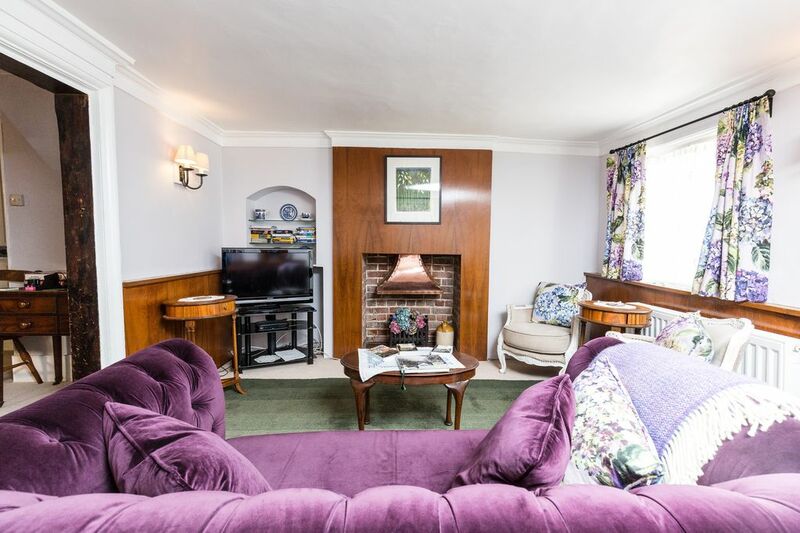 Beautiful brick fireplaces, beamed ceilings, antique furniture and comfy beds make for a delightful holiday home, with the benefit of contemporary bathrooms and kitchen. The elegant living room has WiFi & cable TV and an excellent selection of London tour guides is provided; the dining room seats 6 and has a stunning 17th century fireplace; the contemporary, well-equipped kitchen provides a washing machine, oven, microwave, hob and fridge-freezer. There are 2 spacious double bedrooms - bedroom 1 with king-size double bed & en-suite shower room, and bedroom 2 with two (3ft/ 90cms wide) single beds & en-suite bathroom. Towels & 400-thread Egyptian cotton bed-linen are provided. There is collection of fiction and non-fiction books for your enjoyment. Please note that the kitchen is up a short flight (9 steps) of stairs. (See the photo) Baskets provided for carrying crockery; an additional kettle, toaster coffee-maker in the dining room. JUST TWO OF YOU TRAVELLING? A 1 bedroom/ 2 person configuration of this lovely Cottage is an option. Please inquire. We also have second, smaller cottage, "THE STABLES", which sleeps 2. Details of this smaller cottage are on Home Away at property reference 417278. I bought the Old Bakery in 1978. At first we used the whole of the Old Bakery as a family home, but once the children grew up and had homes and families of their own, we found that we no longer needed such extensive accommodation. So we separated the Baker's Cottage from the other section of the building which was formerly the working bake-house. We also converted the old Stables to living accommodation for guests. Of course, the family love the Old Bakery very much and gather here frequently with an increasing number of our grandchildren. During my career I ran Conservation Campaigns for several famous historic buildings including St Paul's Cathedral, The King Charles Building in Greenwich and Worcester College Oxford (a college of the University). Later I had a private practice as a Psychotherapist from which I retired in 2017. My adult children, Steve and Karen, are both classical musicians ('Cellist and Violinist) , following in the footsteps of their father, who died at a young age. My second husband, Bruce , is a scientist with particular interest in Environmental Sustainability. Between us we have 12 grand-children and so we are kept busy in retirement. We spend a time during the year in South West France where we have a little house in a quiet and beautiful valley. I bought the Old Bakery because I fell in love with its history and its charm. The Old Bakery began its life as a farm house in 17th Century; much later that house was linked to the Bakehouse which stood next door. Baking ceased there in 1960. At first, we used the whole building as a family home but as the children grew up and had homes and families of their own we separated "The Cottage" from "The Bakehouse" again and it became an ideal, self contained holiday home for our guests from around the world. We also converted the old Stables to a smaller holiday home suitable for 2. This is a unique building. Its importance is recognized by its Listed Historic Building status. We love it for its beauty and its atmosphere. Winchmore Hill Conservation Area is also delightful place to live. It has excellent transport links to the centre of London so that we can endulge our love of theatre and music and make frequent visits to art galleries and museum. But it is also an exceptionally friendly residential area where you are greeted in the cafes and shops and where people look out for each other. The separate dining room is in the most historic part of the building and has a beautiful 17th century brick fireplace, beams and exposed brick wall. It is both beautiful and spacious. Warm and cosy, well equipped helpful host, immaculately clean. Everything you may need. Good location for public transport. Relatively easy to park. Restaurants, shops and park all in your doorstep. Quiet area. Thoroughly enjoyed our stay and felt very much at home. Thank you to Nina! We will look forward to welcoming these guests again. It was a pleasure to meet them. Chaulkly's is simply lovely. Impeckably furnished, very neat, and functionable. The pictures you see is exactly what you get. Winchmore Hill was a great area ( lovely restaurants, Sandam, King's Head Pub and Deli on the Green were our favorites. It's location is 30- 45 minutes from London attractions. However the transportation either National rail Service or underground are great. (Southgate Station is usually the quickest to get in town.) Sainsbury is the best grocery around. Everyone in Britain is friendly. ( and helpful to re-route if one of the train lines goes down). So pleased with this vacation. It was worth the 6 month wait. Thank you to Nina for being lovely. I am delighted that this family enjoyed their time in Chalkley's and in Winchmore Hill. I will tell the restaurants, Samdan, the King's Head and The Deli, that they had a good review. It will please them. I think these guests must have been unlucky with the trains from Winchmore Hill. Perhaps there were problems on the line while they were here. As Winchmore Hill station is only 2 minutes walk from the house it is very convenient, and it takes you to (for example) Oxford Circus (main central shopping area) or Leicester Square (theatreland) in 25 - 30 minutes. We always use this route into the centre ourselves. The number of trains reduces on Sundays, which can make it less convenient, and so on Sundays we would sometimes use the Piccadilly line at Southgate as an alternative. Sainsbury's is indeed probably the best and certainly the biggest supermarket near here and is about a 5 minutes walk. However, the Deli on The Green, just over the road from the Old Bakery, sells most grocery and green grocery items you need. We also have a butcher on the Green and a wonderful Sunday market. So if you do not want to go to a big supermarket during your holiday you do not need to. Very impressive gem of a place, situated in beautiful Winchmore Hill. We truly felt at home straight away we stepped inside. I would definitely recommend staying in this beautiful place - it is just wonderful and nearby to Winchmore Station taking you into the bustling capital city. To stay at a historic house that is over 350 years old was a dream since I was a child, so we discide to stay at the old bakery. It was a fanstastic place with history in every corner of the house it seams you could listen to all the stories from former inhabitants. The beds are perfect, the two bath rooms are brand new and the kitchen includes everything you need. But mind your head at the lintel of every door the people in former time where a little bit smaler. In a distance of 7 min. walk you'll find one super pub, 4 restaurants and the Larder a fine place for an english breakfast where we started our day. 3 minutes walk to the station Winchemore Hill to start the daily tour to London City within 30 minutes you are at the Oxfort street or Piccadily Circus. Trains are running from 4 am to 12 pm or you stay at the Piccadily line up to Southegate 24 hours a day and catch a cab to the old backery. It was delightful to have this family to stay. We are looking forward to their return. Thank you to these guests for the lovely review! We are always pleased to hear that guests have enjoyed the historic atmosphere of the house. Some of the former inhabitants of The Old Bakery are mentioned in local history books. A story in Henrietta Cresswell's book tells of the two Quaker sisters who ran the Bakery in the 1860s. They kept bees in their orchard (sadly now built over). When one year they had more honey than they could sell, they made a traditional drink - "mead" -with the honey, but failed to realize that it was an alcoholic drink - with results that shocked their community. We are also regular visitors to "the Larder" as a venue for morning coffee and croissants. The Deli-on-The-Green is also excellent and has a great selection of food to eat in or to take way. Wir hatten eine tolle zeit in the old bakery. Alles hat perfekt funktioniert und war so wie in der beschreibung. Als wir angekommen sind hat uns nina sehr herzlich begrüßt und uns direkt nahrungsmittel zur verfügung gestellt also war der service auch besser als man es erwartet hat. Wenn sie einen städtereise nach london planen und eine unterkunft suchen würde ich ihnen the old bakery empfehlen. Thank you to our guests from Germany for their kind review. ( I have used Google to translate the review into English below for those of you who find it difficult to follow German.) We try of offer all our guests a good welcome; many of them have had a very long journey and arrive here tired. So, we try to put some basic food into the fridge (e.g bread, milk, butter). The Deli on the Green is just across the road but sometimes it helps if you do not have to go straight out to the shops as soon as you arrive! We had a great time in the Old Bakery . Everything worked perfectly and was just like in the description . When we arrived Nina was incredibly welcoming and provided some foodstuffs. So the service was even better than you expected. If you are planning a city trip to London and are looking for accommodation I would recommend the Old Bakery . Perfect location for us, a chance to live in history! This location was wonderful! Granted, it may take you a bit longer to get places than if you are staying right in the heart of London, but you really will feel as if you've moved into a neighborhood and you're making new friends! The girls at the Deli on the Green (a 30 second walk) became good friends and we started most morning with coffee and a roll before setting out. Most nights we grabbed takeaway and ate in front of the telly. There's a small store which stocks just about everything AND it has a cash machine and that's a 60 second walk. We got to know Paul at the wonderful jewelry store, Mistress Appleby's and found gorgeous pieces! Nina is a gracious and knowledgeable host and had sent us so much great information prior to our visit that we knew how to get from Heathrow on the tube, that we needed to buy our National Rail tickets to Bath and Cardiff in advance to save tons of money, and she has a great library of guidebooks. Everything was clean and well-kept and we knew we could count on Nina to handle any issues. (When she went out of town, she had her son step in--very reassuring!) You can LIVE in history! Do not bother with taking the train from Winchmore Hill Station. You're going to have to change anyway, so just take the W9 bus (it's on the same side of the street as the Old Bakery, the bench on the Green) a short 10-minute ride to Southgate Station and take the Piccadilly Line wherever you need to go. BELIEVE NINA WHEN SHE TELLS YOU ABOUT THOSE STAIRS!!! If you have ANY mobility issues, arthritic knees, balance, anything, then you will not enjoy navigating them. The privilege of living in such an amazing historic place means that the original architecture has been preserved as much as possible and that includes the original stairs. Use the laundromat around the corner. Pat will do your laundry and, in our case, delivered it back to Nina and Bruce because we were out all day. It's not worth it to wash in the machine upstairs and haul wet stuff to the dryer-- it only cost 5 pounds to have Pat do it all.